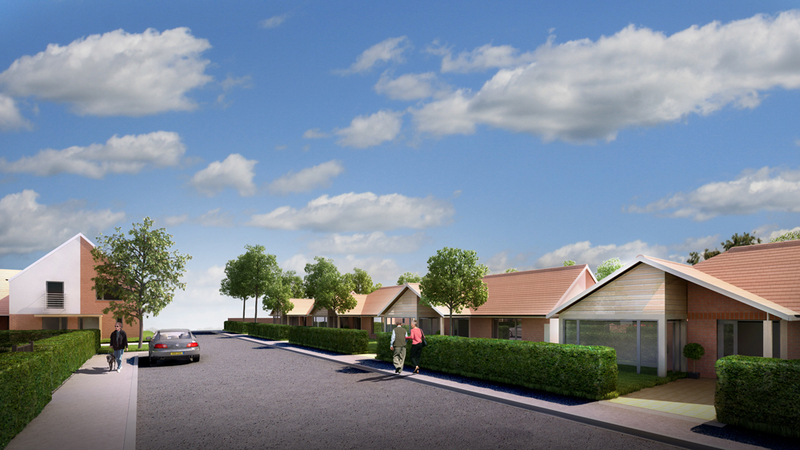 In November 2015, the practice presented designs for a new model of housing scheme developed specifically for people with dementia at the International Dementia Conference in Birmingham. This theoretical scheme proposes five bungalows, each providing accommodation for five tenants with all rooms large enough to fully comply with the wheelchair design guide to accommodate potential changing needs, ensuring residents have the peace of mind knowing they will not have to move. The design clearly defines public areas to the front of the bungalow from the private individual rooms with en-suite facilities to the rear, arranged off an extensively glazed linear corridor which overlooks the communal gardens. Just as much thought has gone into the external areas with enclosed central courtyards, raised planting beds to allow tenants in wheelchair or with reduced mobility to be involved in garden activities, allotment areas, a greenhouse and wildflower gardens.